FIGURE 5. 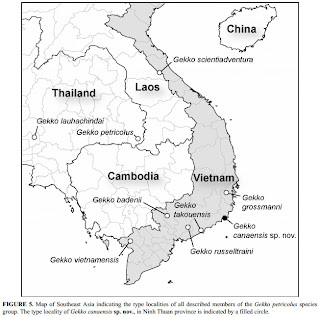 Map of Southeast Asia indicating the type localities of all described members of the Gekko petricolus species group. The type locality of Gekko canaensis sp. nov., in Ninh Thuan province is indicated by a filled circle. Gekko takouensis Ngo & Gamble 2010; and Gekko vietnamensis Nguyen 2010. Panitvong, N., Sumontha, M., Konlek, K. & Kunya, K. 2010. 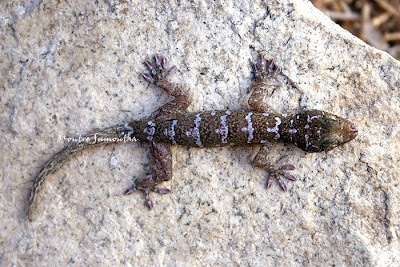 Gekko lauhachindai sp. 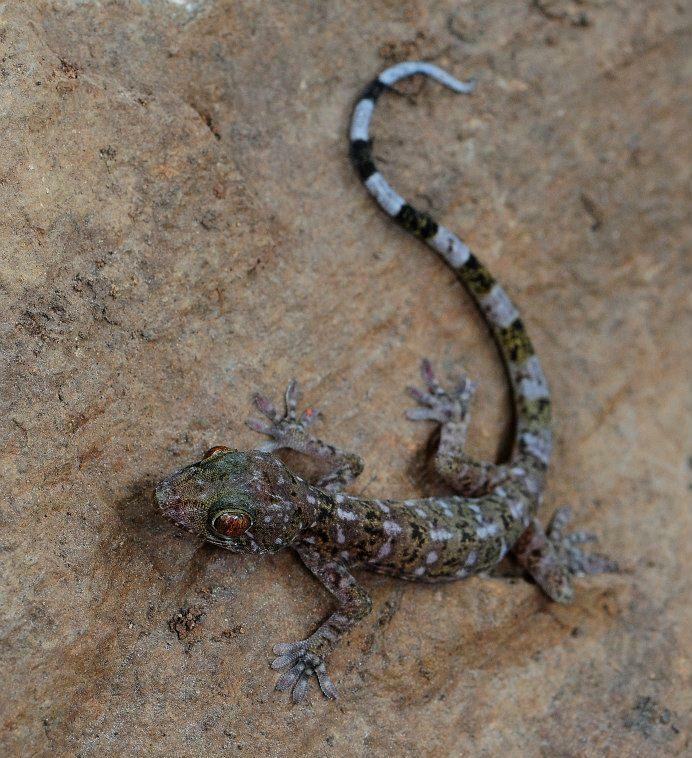 nov., a new cave-dwelling gecko (Reptilia: Gekkonidae) from central Thailand. Zootaxa. 2671, 40–52. 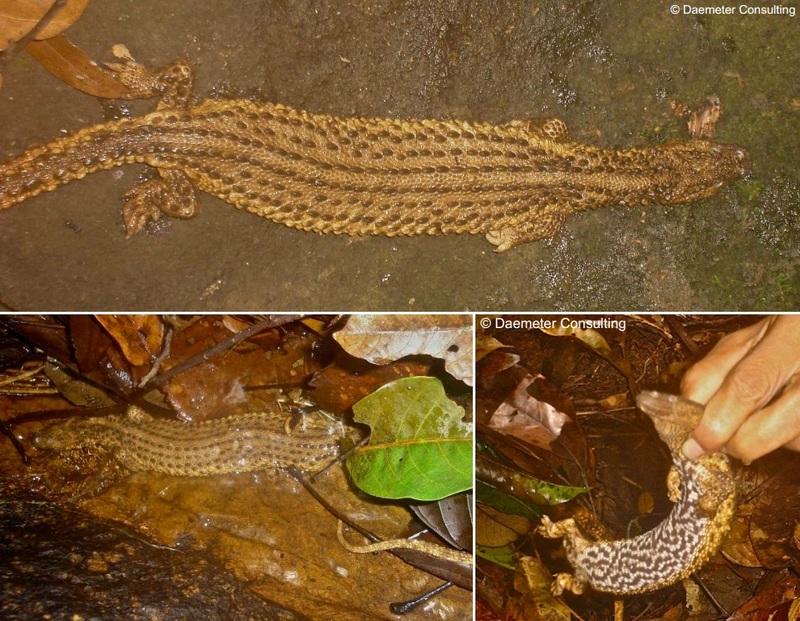 A new species of Gekko Laurenti 1768 is described from southern Vietnam. The species is distinguished from its congeners by its moderate size: SVL to maximum 108.5 mm, dorsal pattern of five to seven white vertebral blotches between nape and sacrum and six to seven pairs of short white bars on flanks between limb insertions, 1–4 internasals, 30–32 ventral scale rows between weak ventrolateral folds, 14–18 precloacal pores in males, 10–14 longitudinal rows of smooth dorsal tubercles, 14–16 broad lamellae beneath digit I of pes, 17–19 broad lamellae beneath digit IV of pes, and a single transverse row of enlarged tubercles along the posterior portion of dorsum of each tail segment. Gekko badenii Szczerbak & Nekrasova 1994; Gekko grossmanni Günther 1994; Gekko lauhachindai Panitvong et al. 2010; Gekko petricolus Taylor 1962; Gekko russelltraini Ngo et al. 2009; Gekko scientiadventura Rösler et al. 2005; Gekko takouensis Ngo & Gamble 2010; and Gekko vietnamensis Nguyen 2010. Here we report a new species of large-bodied gecko in the Gekko petricolus species group from Cà Ná Cape, an isolated mountain in southern Vietnam. Etymology. The epithet is derived from the Cà Ná Cape where the type specimens were collected. A new poreless gecko, Gekko vietnamensis sp. nov., is described from an isolated hill in southern Vietnam. 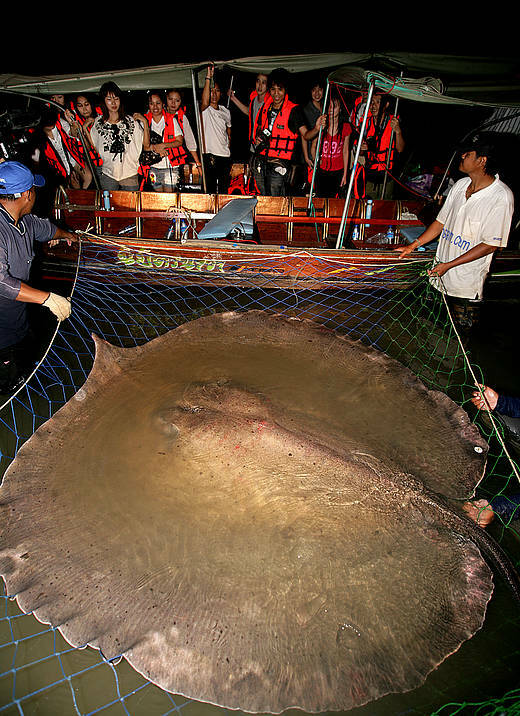 The new species is characterized by a medium size (SVL up to 91 mm); rostral touching nostril; 11–12 supralabials, 10–11 infralabials; body slender with four unclear transverse bands on the back and 28–30 scales across mid-belly; lack of precloacal and femoral pores, no enlarged femoral scales; 18–20 undivided transverse lamellae under the fourth toe; digits free; and tail longer than snout-vent length with enlarged undivided transverse subcaudal scales. A new species, Gekko lauhachindai sp. nov. is described from Saraburi Province in central Thailand. It is a member of the mid-sized Gekko petricolus group and within this group it is probably most closely related to G. grossmanni Günther, 1994, G. scientiadventura Rösler et al., 2005, G. russelltraini Ngo et al., 2009, and G. takouensis Ngo & Gamble, 2010 with which it shares a similar dorsal pattern. The new species is distinguished from its congeners by its moderate size (SVL at least to 98 mm) and slender body, rostral participation in the nostril border, precloacal pores 12–14, femoral pores absent, dorsal tubercle rows 14, snout less than 1.5 times eye diameter, presence of “I” shaped rostral groove, interorbital scale rows 36–40, digit I and IV of pes with 13 and 13–15 enlarged subdigital scansors, respectively, and dorsal pattern of large bright spots dorsally that may be expanded to 5–6 whitish narrow cross bars intersected by a bright mid-dorsal dotted line from nape to sacrum. The new species is one of many recently described Southeast Asian geckos that appear to be restricted to limestone caves. It is the seventh species of Gekko known from Thailand and the third Gekko occurring in sympatry in the karst forests of Chalermphrakiat District, Saraburi Province, central Thailand. A new species of Gekko Laurenti is described from Tà Kóu Mountain, an isolated granitic peak in Tà Kóu Nature Reserve, Ham Thuan Nam district, Binh Thuan province, southern Vietnam. The species is distinguished from its congeners by its moderate size, with snout to vent length (SVL) reaching a maximum 107.0 mm; dorsal pattern of 5–8 white vertebral blotches between the nape and sacrum and 6–8 pairs of short white bars on the flanks; 11–14 precloacal pores in males; 14–17 longitudinal rows of smooth dorsal tubercles; and 18–20 broad lamellae beneath the fourth toe. Gekko takouensis sp. nov. is the second endemic gekkonid discovered in the Tà Kóu Nature Reserve, Cyrtodactylus takouensis Ngo & Bauer being the first. Ngo, V.T. & Gamble, T. 2010. 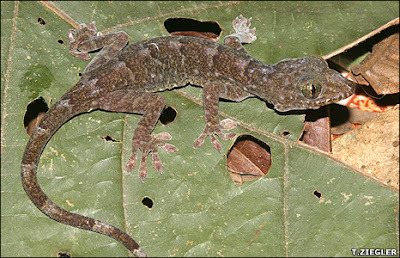 A new species of Gekko (Squamata: Gekkonidae) from Tà Kóu Nature Reserve, Binh Thuan Province, Southern Vietnam. Zootaxa. 2346, 17–28. 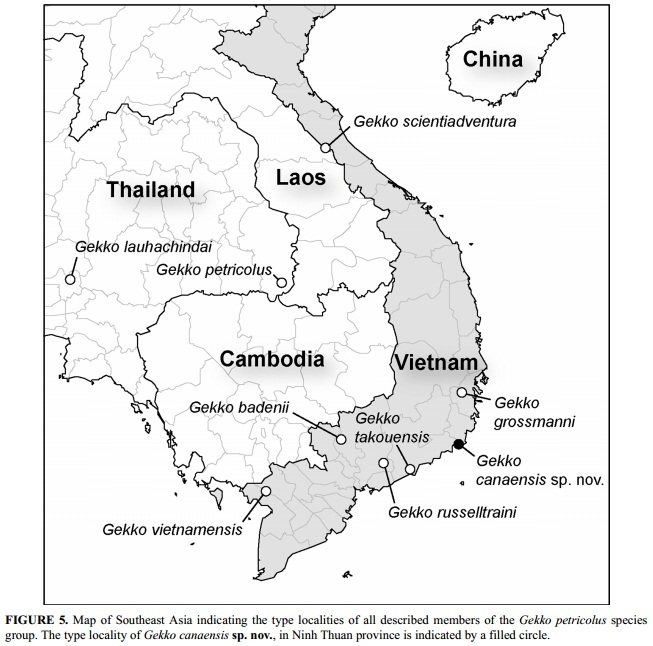 In Vietnam, a total of seven species of Gekko are currently recognized: G. badenii, G. chinensis, G. gecko, G. grossmanni, G. palmatus, G. scientiadventura, and G. ulikovskii (Rösler et al. 2004; Nguyen et al. 2009). Both Gekko badenii and G. ulikovskii were simultaneously described in 1994 based on the type series collected from Ba Den Mountain in Tay Ninh Province and “Gilai-Con Tum Province” (now Kon Tum Province) near the border with Laos and Cambodia, respectively (Darevsky & Orlov 1994; Szczerbak & Nekrasova 1994). Nguyen, Q.T., Schmitz, A. & Böhme, W. 2010. Gekko ulikovskii Darevsky & Orlov, 1994: a junior synonym of Gekko badenii Szczerbak & Nekrasova, 1994. Bonn Zoological Bulletin. 57, 15–17. 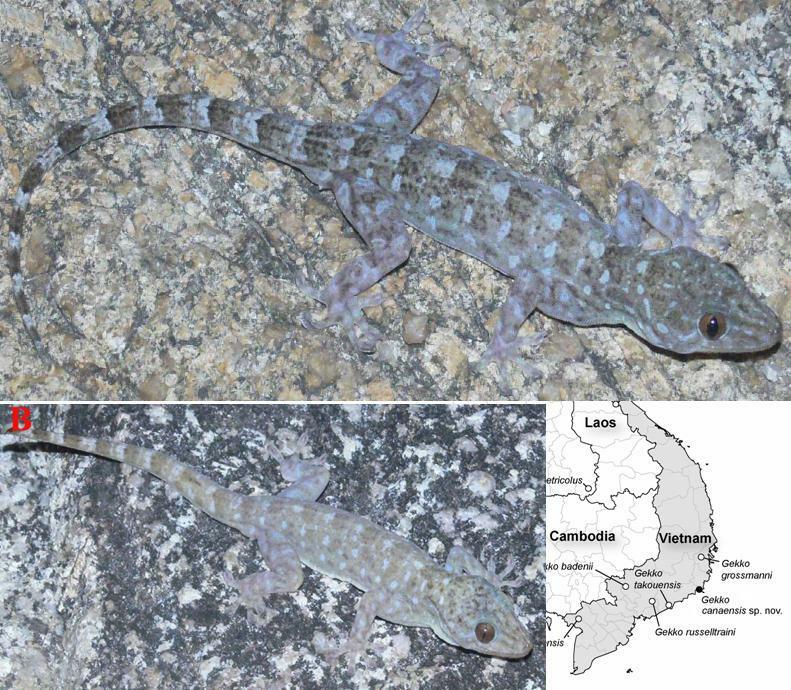 A new endemic species of Gekko, G. russelltraini, is described from Chua Chan Mountain, an isolated granitic peak inthe Xuan Loc district, Dong Nai province, southeastern Vietnam. The species is distinguished from its congeners by itsmoderate size (SVL 70.3–82.9 mm), 8–11 precloacal pores in males, 12–16 longitudinal rows of very weakly enlarged,smooth dorsal tubercles, 17–18 lamellae beneath digit IV of pes, and dorsal pattern of five to seven white vertebral blotches between nape and sacrum and four to seven pairs of short white bands on flanks between limb insertions. Gekko russelltraini is a member of a group of mid-sized Indochinese Gekko sharing similar habitus, scalation, and color patternelements and is the seventh member of its genus confirmed for Vietnam. Ngo, V.T., Bauer, A.M., Wood Jr. P.L. & Grismer, J.L. (2009) A new species of Gekko Laurenti, 1768 (Squamata: Gekkonidae) from . Zootaxa, 2238, 33–42. Rösler, H., Ziegler, T., Vu, N.T., Herrmann, H.W. & Böhme, W. 2005. A new lizard of the Genus Gekko Laurenti, 1768 (Squamata: Sauria: Gekkonidae) from the Phong Nha - Ke Bang National Park, Quang Binh province, Vietnam. Bonner Zoologische Beiträge. 53, 135–148. 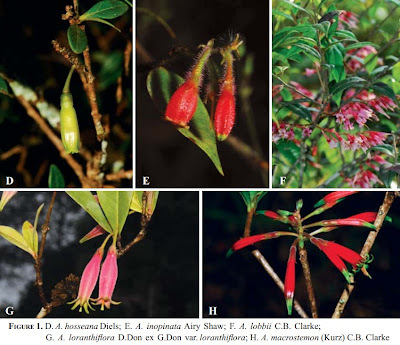 A taxonomic revision of the genus Agapetes D. Don ex G. Don in Thailand is presented. Twelve species are recognized. A key to the species, descriptions, ecological data and geographical distributions are provided. Agapetes D. Don ex G. Don is distributed from the Himalayan region to south China and mainland southeastern Asia and comprises ca. 80 species. It belongs to the tribe Vaccinieae Rchb. 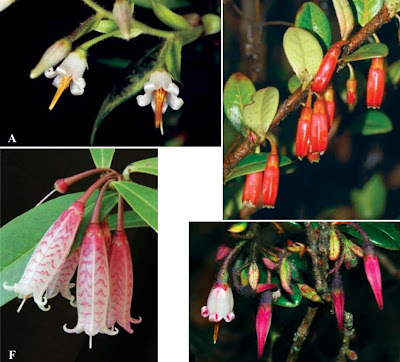 (Stevens et al., 2004) but the generic delimitation has not been solved satisfactorily due to the very closely related polyphyletic genus Vaccinium L. (Stevens, 1985; Stevens et al., 2004; Ruizheng & Stevens, 2005). Watthana, S. 2012. 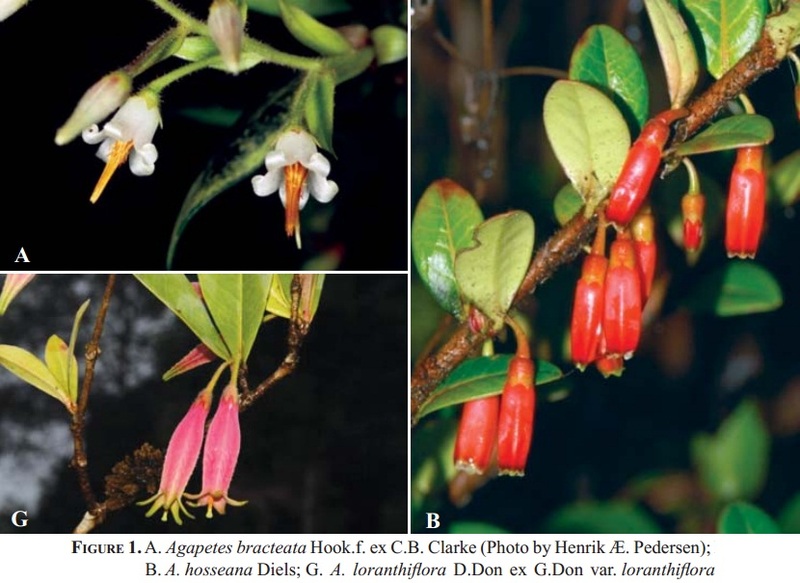 The genus Agapetes D. Don ex G. Don (Ericaceae) in Thailand. Thai Journal of Botany. 4 (1): 99-116. 2012. 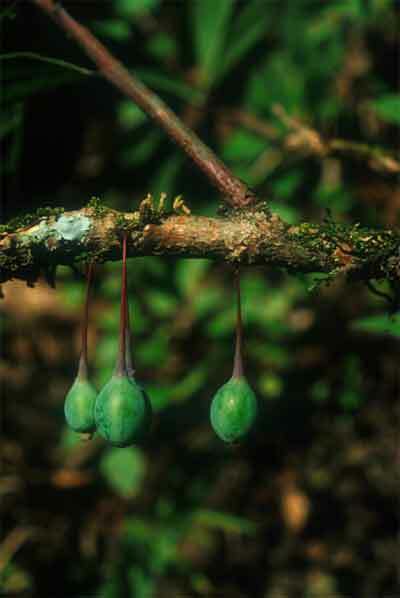 Watthana, S. and C. Trisonthi. 1999. Agapetes inopinnata Airy Shaw, a New Record for Thailand. Thai Forest Bulltin. 27: 19-23. 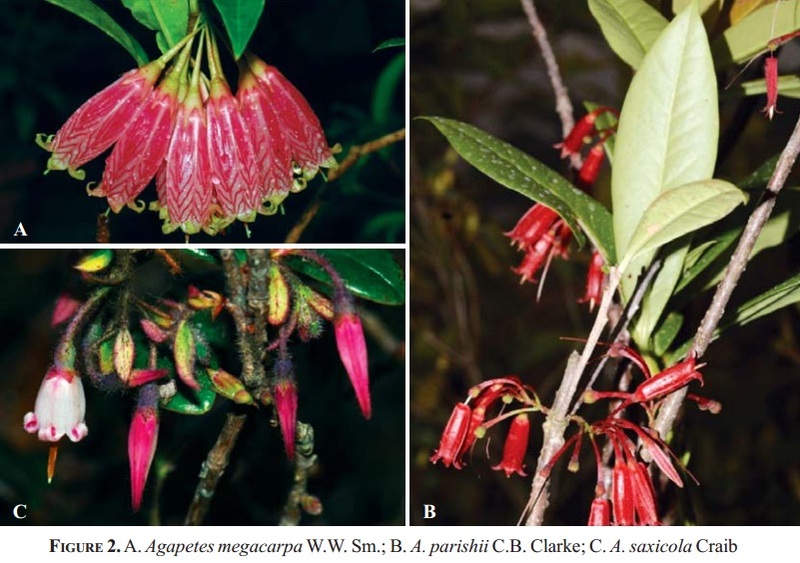 A new species of Agapetes (Ericaceae) from Thailand is described and illustrated. 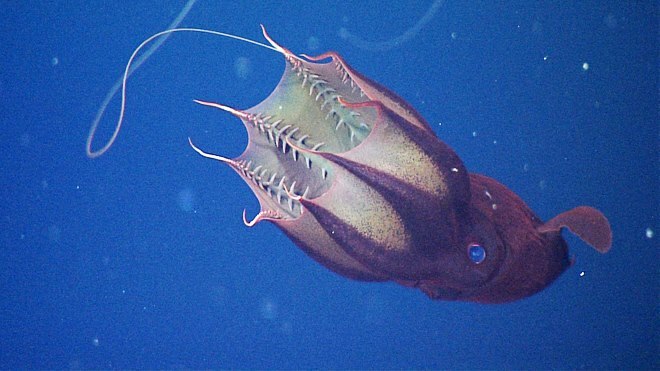 Vampire squid (Vampyroteuthis infernalis) are considered phylogenetic relics with cephalopod features of both octopods and squids. They lack feeding tentacles, but in addition to their eight arms, they have two retractile filaments, the exact functions of which have puzzled scientists for years. We present the results of investigations on the feeding ecology and behaviour of Vampyroteuthis, which include extensive in situ, deep-sea video recordings from MBARI's remotely operated vehicles (ROVs), laboratory feeding experiments, diet studies and morphological examinations of the retractile filaments, the arm suckers and cirri. 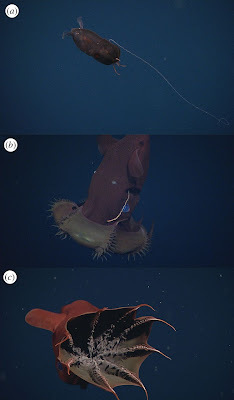 Vampire squid were found to feed on detrital matter of various sizes, from small particles to larger marine aggregates. Ingested items included the remains of gelatinous zooplankton, discarded larvacean houses, crustacean remains, diatoms and faecal pellets. 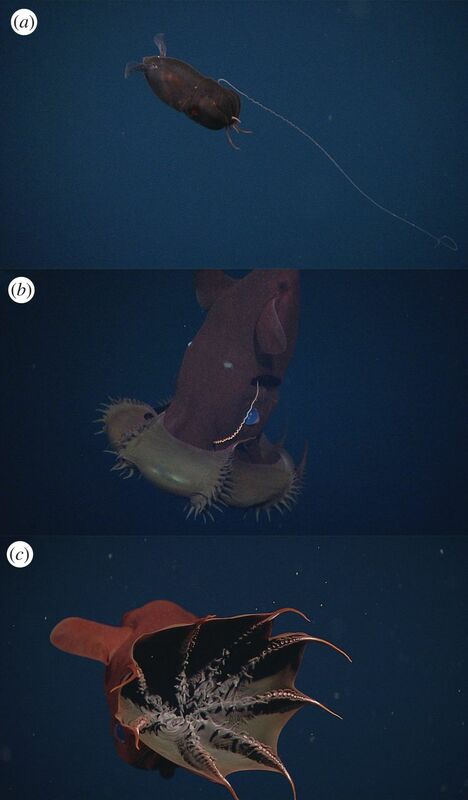 Both ROV observations and laboratory experiments led to the conclusion that vampire squid use their retractile filaments for the capture of food, supporting the hypothesis that the filaments are homologous to cephalopod arms. 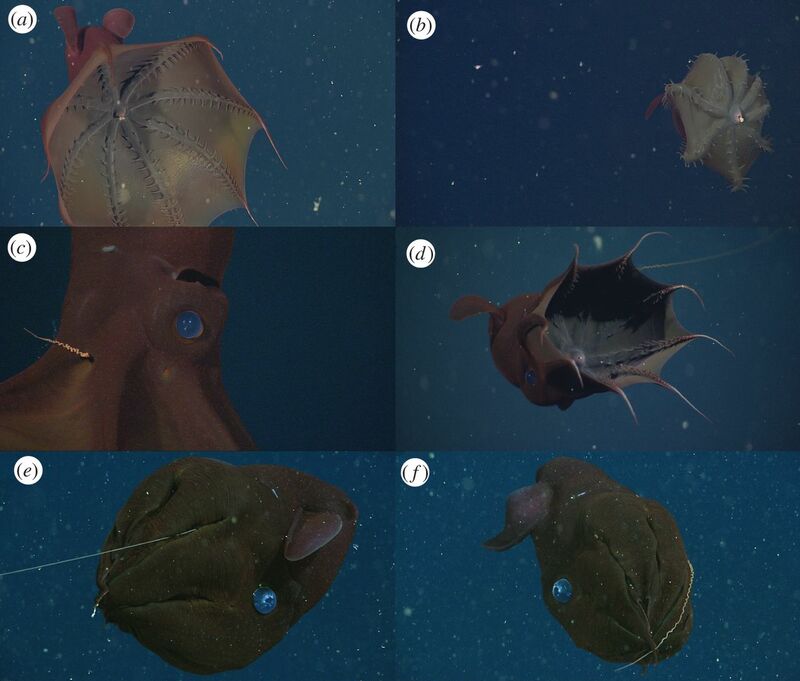 Vampyroteuthis' feeding behaviour is unlike any other cephalopod, and reveals a unique adaptation that allows these animals to spend most of their life at depths where oxygen concentrations are very low, but where predators are few and typical cephalopod food is scarce. Figure 1. (a) A juvenile Vampyroteuthis with its filament extended, the short peduncle is visible at the base of the filament. (b) A vampire squid with a retrieved filament and the web partly curled, revealing the arms and cirri. (c) Oral view into the vampire squid's web showing the arms with cirri and the suckers present on the distal half of the arm. Figure 4: (a) An oral view of Vampyroteuthis infernalis. (b) A marine aggregate in the mouth of vampire squid. (c) A dorso-lateral close-up of the left side of the head of a vampire squid, showing the filament being retracted, a mucus trail is visible on the filament. (d) An oral view of a vampire squid showing a trail of mucus with associated food particles running to the mouth. (e) A vampire squid with a forward-extended filament and a piece of marine snow on the tip of the second right arm. (f) The same specimen shown in (e) now retrieving the filament along the tips of its arms. | The vampire squid's mouth opens up like an umbrella. Biologists say they have unlocked secrets about the vampire squid, a mysterious creature that feeds on the decaying dead in the unlit depths. 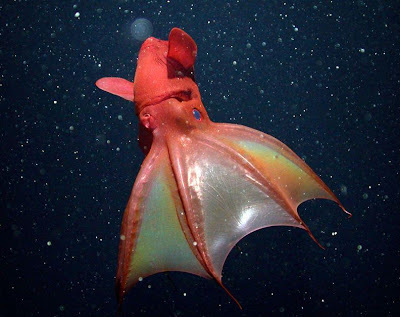 The vampire squid Vampyroteuthis infernalis's mouth opens up like an umbrella. Park. Poovar is about 20km (on ground) north east of Anamudi summit (Images 1 & 2). The GPS location of the present sighting is 10ํ17’07.04”N and 77ํ0 06’10.8”E, at an altitude of 2522m. The macro habitat of the Poovar is grassland-shola forests, while the R. resplendens was sighted in the grassland (Image 3) and was seen within the grass clump. The nearby shola patch from the current sighting is at least 1km away. the present sighting of R. resplensens from Poovar region within Eravikulam National Park, ~20km north-east off the type locality, could be the first site record of the R. resplensens outside the type locality. 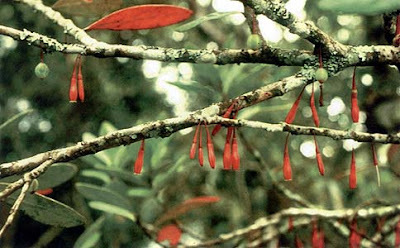 It is likely that R. resplensens may be more widespread in the high altitude primary grasslands of Eravikulam National Park and surrounding areas of the Western Ghats, than it was earlier thought. Biju, S.D., Y. Shouche, A. Dubois, S.K. Dutta & f. Bossuyt. 2010. A ground-dwelling rhacophorid frog from the highest mountain peak of the Western Ghats of India. Current Science. 98(8): 1119–1125. 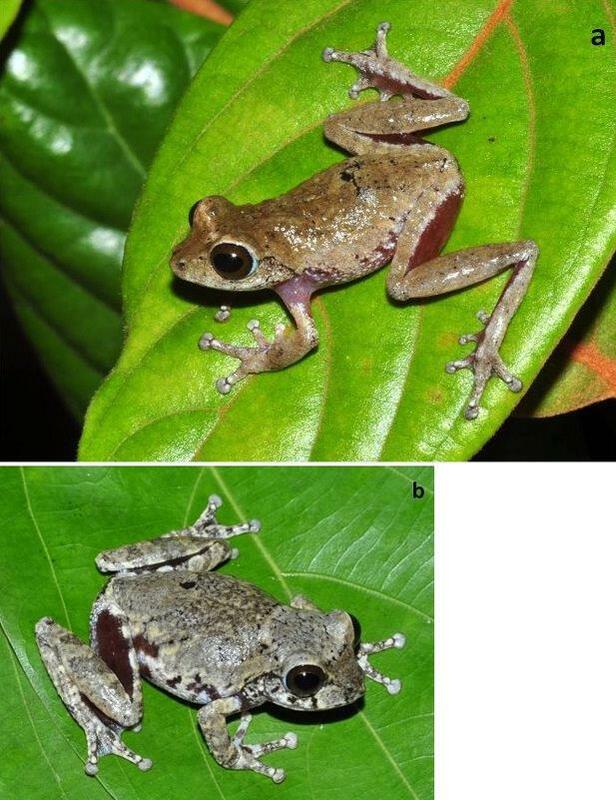 A new species of the shrub frog genus Raorchestes Biju, Souche, Dubois, Dutta and Bossuyt is described as Raorchestes kakachi sp. nov. from Agastyamalai hill region in the southern Western Ghats, India. 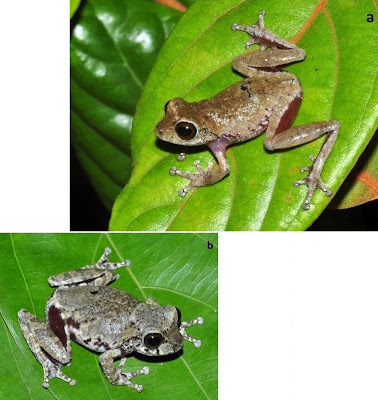 The small sized Raorchestes (male: 24.7–25.8 mm, n = 3 and female: 24.3–34.1 mm, n = 3) is distinguished from all other known congeners by the following suite of characters. Snout oval in dorsal view; tympanum indistinct; head wider than long; moderate webbing in feet; colour on dorsum varying from ivory to brown, blotches of dark brown on flanks, brown mottling on throat reducing towards vent; inner and outer surface of thigh, inner surface of shank and inner surface of tarsus with a distinct dark brown horizontal band which extends upto first three toes on upper surface. A detailed description, advertisement call features, ecology, natural history notes and comparison with closely related species are provided for the new species. eshadri. K.S., Gururaja. K.V., Aravind. N.A., 2012. A new species of Raorchestes (Amphibia: Anura: Rhacophoridae) from mid-elevation evergreen forests of the southern Western Ghats, India. Zootaxa 3410: 19–34. Image 3. Lanthanotus borneensis as it was found after sweeping back leaves that covered most of its body, but prior to being handled. L. borneensis is semi aquatic and known to retreat to water when under threat (Pianka & Vitt 2003). 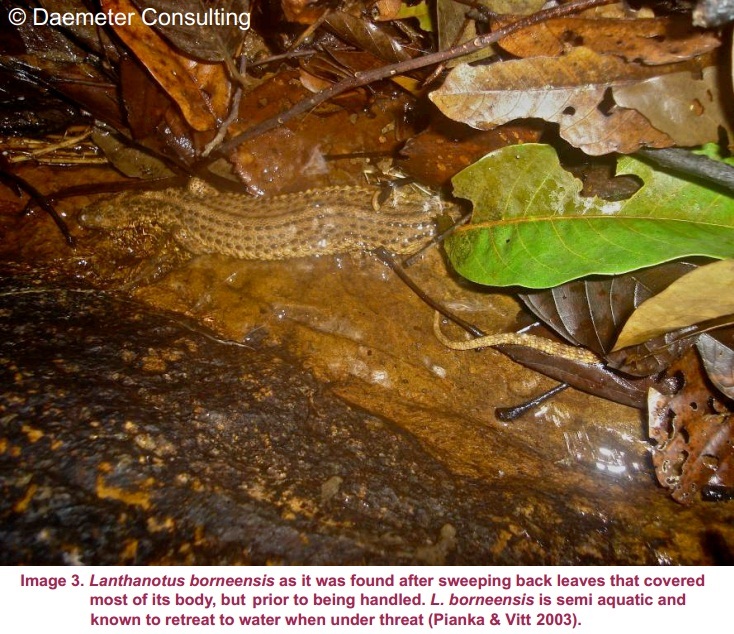 Abstract: The following paper presents the first published record of the cryptic Borneo Earless Monitor (Lanthanotus borneensis Steindachner, 1877) from West Kalimantan (Indonesian Borneo). This sole member of the family Lanthanotidae is endemic to Borneo. Since its description in 1877, all locality records of specimens refer to Sarawak (Malaysian Borneo). The recent discovery of this “living fossil” in an oil palm estate under development in Landak District expands its known distribution southward to Kalimantan. This paper (i) describes the circumstances of the discovery, characteristics of the individual and microhabitat structure in which it was found, (ii) provides results from local community interviews about the local distribution of the species, suggesting it is found more broadly in the Landak District and possibly elsewhere, and (iii) places this information in a broader context of current knowledge and high conservation value of L. borneensis. Keywords: Biodiversity, biogeography, conservation, Indonesia, Kalimantan, Lanthanotus borneensis, oil palm. Image 4. Lanthanotus borneensis laid out on a rock. The photo clearly displays the characteristic six longitudinal dorsal rows of enlarged scales that run from neck to tail-base on this species (Pianka & Vitt 2003). 2012. First record of the Borneo Earless Monitor Lanthanotus borneensis (Steindachner, 1877) (Reptilia: Lanthanotidae) in West Kalimantan (Indonesian Borneo). ournal of Threatened Taxa. first collected in 2000 by Prof Taylor and Dr Cotterill in northwestern Zimbabwe. It has the highest echolocation frequency of all the members of Rhinolophus hildebrandtii species-complex. Gigantism and dwarfism evolve in vertebrates restricted to islands. We describe four new species in the Rhinolophus hildebrandtii species-complex of horseshoe bats, whose evolution has entailed adaptive shifts in body size. We postulate that vicissitudes of palaeoenvironments resulted in gigantism and dwarfism in habitat islands fragmented across eastern and southern Africa. Mitochondrial and nuclear DNA sequences recovered two clades of R. hildebrandtii senso lato which are paraphyletic with respect to a third lineage (R. eloquens). Lineages differ by 7.7 to 9.0% in cytochrome b sequences. Clade 1 includes R. hildebrandtii sensu stricto from the east African highlands and three additional vicariants that speciated across an Afromontane archipelago through the Plio-Pleistocene, extending from the Kenyan Highlands through the Eastern Arc, northern Mozambique and the Zambezi Escarpment to the eastern Great Escarpment of South Africa. Clade 2 comprises one species confined to lowland savanna habitats (Mozambique and Zimbabwe). A third clade comprises R. eloquens from East Africa. Speciation within Clade 1 is associated with fixed differences in echolocation call frequency, and cranial shape and size in populations isolated since the late Pliocene (ca 3.74 Mya). Relative to the intermediate-sized savanna population (Clade 2), these island-populations within Clade 1 are characterised by either gigantism (South African eastern Great Escarpment and Mts Mabu and Inago in Mozambique) or dwarfism (Lutope-Ngolangola Gorge, Zimbabwe and Soutpansberg Mountains, South Africa). Sympatry between divergent clades (Clade 1 and Clade 2) at Lutope-Ngolangola Gorge (NW Zimbabwe) is attributed to recent range expansions. We propose an “Allometric Speciation Hypothesis”, which attributes the evolution of this species complex of bats to divergence in constant frequency (CF) sonar calls. The origin of species-specific peak frequencies (overall range = 32 to 46 kHz) represents the allometric effect of adaptive divergence in skull size, represented in the evolution of gigantism and dwarfism in habitat islands. Figure 1. 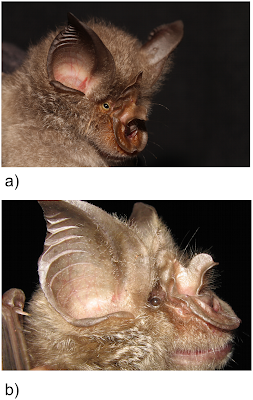 Portraits of (a) Rhinolophus smithersi species novo, and (b) Rhinolophus mossambicus species novo, two of four new cryptic species described herein within the R. hildebrandtii complex. a medium-sized species in the complex. It appears widespread, recorded in Mozambique and northwest Zimbabwe. "The Mozambican Horseshoe Bat is genetically a very distinct species from that of Rhinolophus hildebrantii," says Dr Samantha Stoffberg of Stellenbosch University. "It is probably widely distributed throughout Mozambique." has so far only been found around Mount Mabu and Mount Inago in northern Mozambique, but could possibly also live in the nearby Malawi Rift, and Namuli, Chiperone and the Mulanje mountains. The first museum specimens of this species were collected during an assessment of the biodiversity of mountains across northern Mozambique above 1500m, which was made possible through a British government funded Darwin Initiative award. The assessment project is coordinated by Dr Julian Bayliss. The area is known as one of Africa's most poorly explored territories. "We chose this bat's name to draw attention to the serious threat to the unique biodiversity isolated on the montane forest islands in northern Mozambique, notably Mount Mabu and Mount Inago," says Dr Julian Bayliss of the Conservation Science Group at the University of Cambridge and the Mulanje Mountain Conservation Trust in Malawi. "None of these landforms lie within formally protected areas, and are all undergoing major habitat degradation and destruction from human activities such as timber harvesting and agriculural practices." A veritable wealth of new, unique species of butterflies, snakes, crabs and chameleons have also recently been discovered on Mount Mabu, which has also turned out to be the largest rainforest in southern Africa. first collected in 2000 by Prof Taylor and Dr Cotterill in northwestern Zimbabwe. It has the highest echolocation frequency of all the members of this species-complex. "So far it seems to be only found in the northwestern regions of the Zambezi escarpment in Zimbabwe, and remote areas of the Kruger National Park around Pafuri, and the Soutpansberg Mountains in Limpopo," says Dr Woody Cotterill of Stellenbosch University. Some populations occur in the newly proclaimed Vhembe UNESCO Biosphere Reserve. "We need to study its distribution further to find out if it is more widespread across the savannah woodlands of the Limpopo and Zambezi valleys, and their escarpments." Smithers' Horseshoe Bat is named after the late Dr Reay Smithers, founding director of the National Museums of Zimbabwe. The remarkable legacy of his commitment to taxonomy and museums is represented in the largest scientific collection of mammals in the Southern Hemisphere, in Bulawayo's Natural History Museum. Dr Smithers fostered its growth for over three decades. His most well-known book, The Mammals of the Southern African Subregion, was first published in 1983, and was revised and reprinted again in 2005. "He was a prodigious collector and researcher of mammals including bats, and the author of important regional texts on the mammals of Botswana, Zimbabwe and Mozambique," says Prof Taylor. first discovered by Mpumalanga Tourism and Parks Agency scientist Lientjie Cohen in 2004 in the Barberton Mountainlands Nature Reserve near Barberton. Cohen is an active member of the Gauteng and Northern Regions Bat Interest Group. "We are naming this bat species after Ms Cohen to acknowledge her significant contribution towards the conservation and discovery of new bat species in South Africa, and particularly in Mpumalanga," says Prof Peter Taylor of the University of Venda. Cohen's Horseshoe Bat (Rhinolophus cohenae) has the lowest call peak frequency of the five Rhinolophus species under investigation. It has a very wide noseleaf. It is believed to only be found in the Mpumalanga province of South Africa, for instance in the Sudwala area near Nelspruit. "I am not aware of any other bat species being endemic to Mpumalanga Province, which would make this species one of great conservation importance," adds Prof Taylor. Described is Rhinolophus maendeleo n. sp. 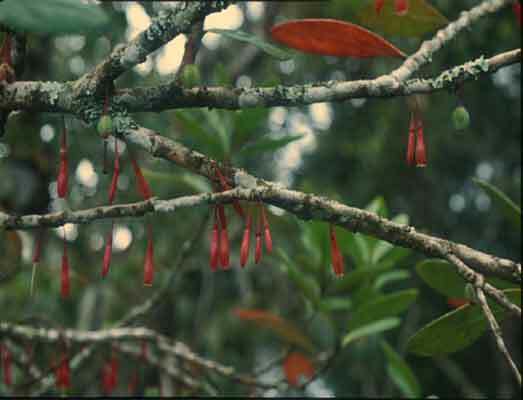 from the Coastal Lowland forests, Tanzania. The new species differs from its closest relative Rh. adami by the shape of noscleaf and by cranial and baCillar characteristics. The systematics of the new species and its Central African forest-dwelling relative is discussed. Keywords: Chiroptera, Rhinolophus, new species, systematics, adami-group, Tanzania, Coastal Lowland forests, biogeography. Kock, D., G. Csorba, and K. M. Howell. 2000. Rhinolophus maendeleo n. sp. From Tanzania, a horseshoe bat noteworthy for its systematics and biogeography (Mammalia, Chiroptera, Rhinolophidae). Senckenbergiana biologica. 80 (1/2). 233-239. Conchostracans and corixids are part of the diet of extant salamanders, an ecologically important fact in a lacustrine environment. Here we report their discovery in the guts of the aquatic Jurassic salamanders Jeholotriton paradoxus and Chunerpeton tianyiensis, formerly abundant at Daohugou, Ningcheng County, Inner Mongolia, China. This reveals something of the ecology of this important, ancient, vertebrate and invertebrate assemblage. 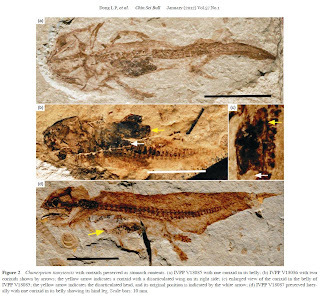 The new fossil evidence indicates the highly selective feeding of these Jurassic salamanders; Jeholotriton preyed only on juveniles of the conchostracan Euestheria luanpingensis, and Chunerpeton only on the corixid Yanliaocorixa chinensis. We can infer the dietary differences as a consequence of different jaw and hyoid structures; and thus niche partitioning in Jurassic salamanders. Salamanders are a model system for studying the rates and patterns of the evolution of new anatomical structures. Recent discoveries of abundant Late Jurassic and Early Cretaceous salamanders are helping to address these issues. Here we report the discovery of well-preserved Middle Jurassic salamanders from China, which constitutes the earliest known record of crown-group urodeles (living salamanders and their closest relatives). 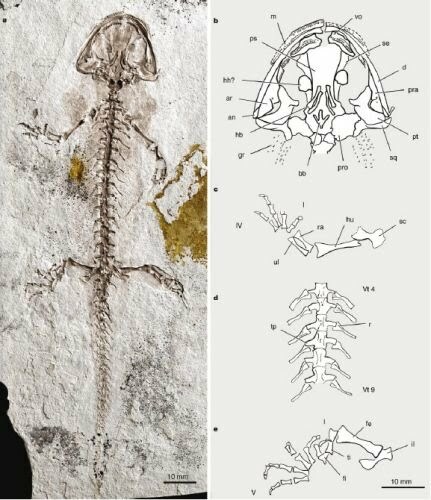 The new specimens are from the volcanic deposits of the Jiulongshan Formation (Bathonian), Inner Mongolia, China, and represent basal members of the Cryptobranchidae, a family that includes the endangered Asian giant salamander (Andrias) and the North American hellbender (Cryptobranchus). These fossils document a Mesozoic record of the Cryptobranchidae, predating the previous record of the group by some 100 million years. This discovery provides evidence to support the hypothesis that the divergence of the Cryptobranchidae from the Hynobiidae had taken place in Asia before the Middle Jurassic period. Chunerpeton tianyiensis gen. et sp. nov.
Gao, K. Q., and Shubin, N. H., 2003. Earliest known crown-group salamanders: Nature. 422. 424-428. doi:10.1038/nature01491. ► Their climate space is characterized by high humidity with MAP values over 900 mm. ► Cenozoic distribution suggests high Central Asian humidity during global warm periods.